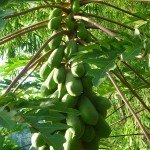 The local food in Thailand are fresh and fragrant. Delicious! Well known for their balance of flavour and sophisticated balance of all the different types of flavour: sweet, salty, sour and hot! A deep crimson chili paste is pre-made by Thai households and is kept in tub for use in pretty much all curries and sauces, which clearly shows how much it is used in everything in northern Thai food. Having a little smell of the tub is an intense combination of mostly chili and lemongrass, while the other spices provide the richness and depth that this chili paste is known for. It is a good idea, if you are a fan of Thai food to produce this in bulk as freshly made chili paste is so much more flavoursome than the jarred variety. That said this paste is fine if it is frozen fresh and then real local food in Thailand becomes a very quick and easy meal in your home. Often it is these base pastes and sauces that give each country its distinct taste. In Thailand it is the fiery hot chili paste. 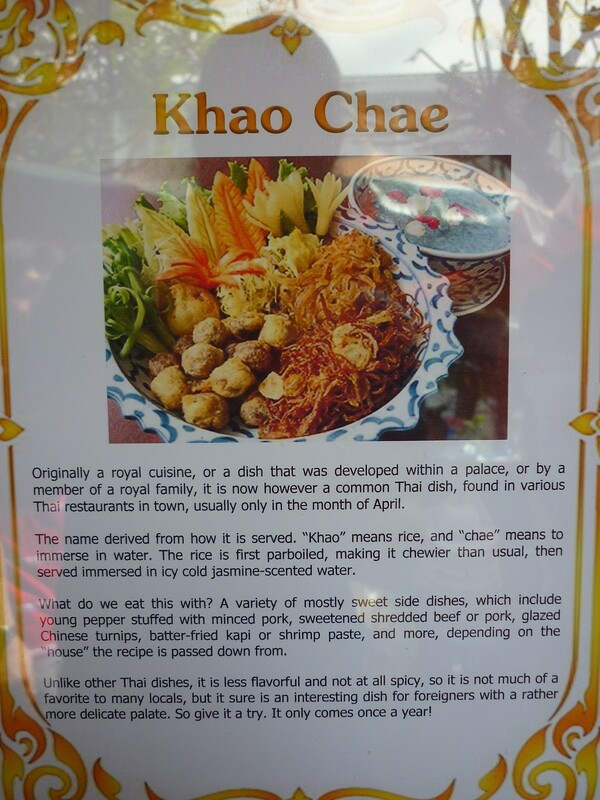 Mu Thot are an example of local food in Thailand and something that is reminiscent of a more western dish. Deep fried meatballs like these are generally eaten for a special occasion as they are fatty and rich, which is not a style that Thai people like to eat too much of. 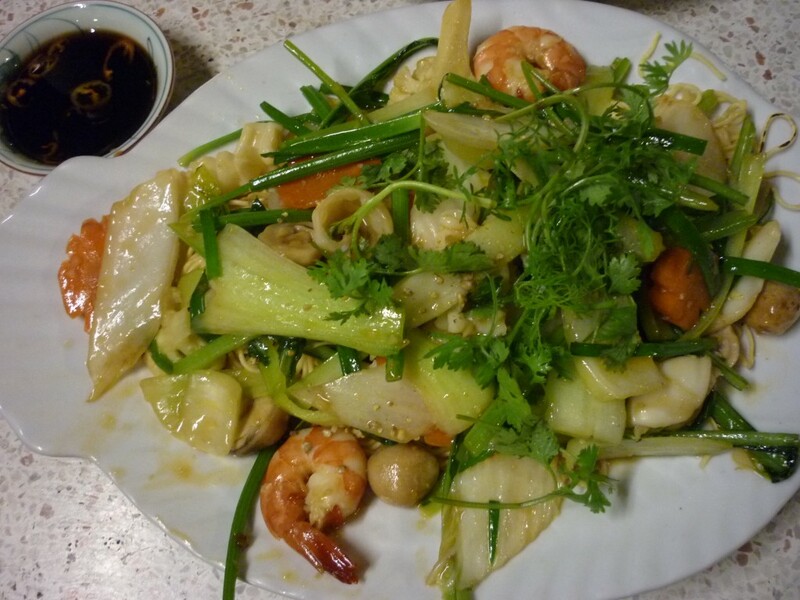 They are also combined with oats to provide more substance at lower cost and even has a good glug of oyster sauce. Our hosts told us they were delicious and that they would eat them more if pork wasn’t so expensive and it wouldn’t make them fat! Flat noodle dishes are perhaps the most representative style that the Thai people are known for as every lunchtime people sit down and tend to eat a noodle dish of some kind. Like other Asian countries it is often the accompaniments that really set the dishes off and fresh lime over food has become a firm favourite for me. Yet the Thais are artisans at balancing the numerous types of taste humans experience and balancing them so that you are taken on a journey of taste where hot is replaced by sour and then sweet to finish. All in one mouthful. Exotic fruit and herbs are everywhere and similarly to the other South East Asian countries Thailand understands how to balance them and use them to get the most of their value and flavour. 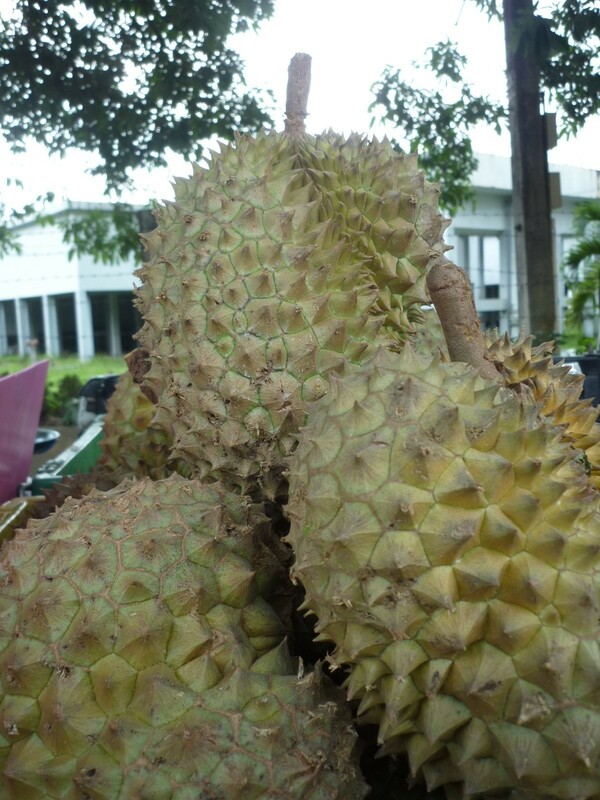 Although on occasion there are just some things that I just cannot handle and Durian fruit is one of them. When experiencing local food from Thailand it quickly became clear there would be things that would be challenging! Although Durian smells like rotting flesh (literally) and are banned from being taken onto public transport the taste could be good. Yet for me it just was not a goer. The people we met claimed that the durian we bought was not the freshest and the young, fresh durian has a far different taste. 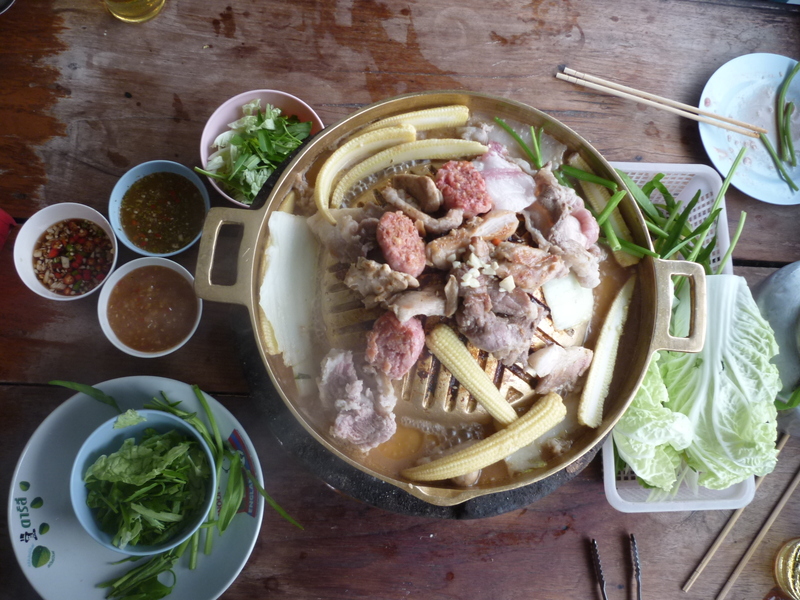 Local food in Thailand like the “Volcano BBQ” below is familiar in Korea, Laos and Cambodia. Each laid their claim to the method. I suspect it originated in Korea, but either way such a method is characterised by what goes on it and in Thailand the choice was far great than other countries we experienced it. I love BBQ and the idea of pouring water around the edge of this BBQ dome with fat sat on the top to run through the ingredients being cooked and therefore produce the sauce automatically is inspired. Local food from any country is often diverse in its relation to class and the society at specific points in time. Royal food is now becoming more accessible to the masses. 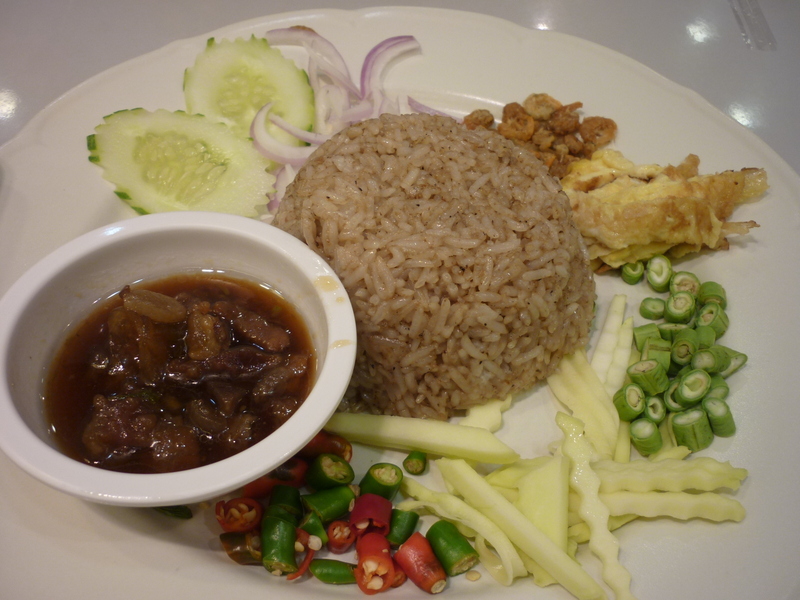 Khao Chae is a perfect example as it is rich and uses expensive ingredients. The growing number of recipes from Around the World Travels focus on the less well known dishes that are local from the regions we found them. Many are taken from our book “Sharing the world’s local food”, which you can buy below. If you have a recipe you would like to share we would love to hear from you even more! Please comment below, share and we would be more than happy to credit you and your website. …where all of these fine recipes have been taken. A feast of delights in our recipe book of dishes based on 2 and 1/2 years research, signed as a thank you. Online price is now only £24.99.